We modified an invoice in QuickBooks and we are trying to get the data out in Excel, but QODBC gives us the old data still. QODBC failed to return full records is usually caused by either corruption of QODBC optimizer file. I would like to inform you that Optimizer file may be corrupted if you are killing process or query while optimizer file is building. It is not advisable to kill query while it is in execution. Please reset the optimizer to solve the problem. 1) Close all other applications that use QODBC. 3) Find the file with .opt extension at the path you had assigned to QODBC optimizer and delete the optimizer file. 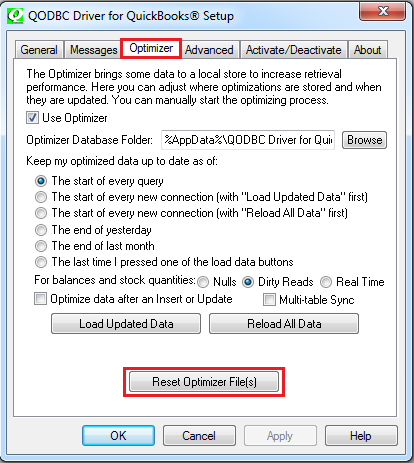 You can find optimizer folder path from QODBC Setup Screen->”Optimizer” tab. Please copy this path & navigate to this path & delete .opt file. Start>>All Programs>> QODBC Driver for use with QuickBooks>>QODBC Setup Screen>>”Optimizer” tab>>Click "Reset Optimizer File(s)". This command will bring some data to a local cache to increase retrieval performance for queries. I would like to suggest you please let run above command completely. Above command may take some time depends on your records in QuickBooks. It may take 2-24 hours or more depends on the number of records in QuickBooks company file. Please let this command run completely do not kill this command. It is not advisable to kill/close the application while it's building the Optimizer file. 6) Please test again to see if the problem is still there. 7) After completing above steps, please test data from VB Demo application. If you are able to get updated data, then please refresh Excel sheet so you can get updated data.